You’re minutes away from learning how to track and measure the return on investment (ROI) from all of your digital marketing. No more guessing that your SEO, advertising, email marketing, social media, and any other channel you’re investing in is generating leads and sales. By going through the steps in this guide, you’ll be able to pinpoint exactly which campaigns are working and which are simply wasting your marketing dollars. We’ve all seen it happen — a new business launches in what seems like a prime location, only to close just months later. Unfortunately, this is the simple reality of business. A great location with exposure to consumers is important, but also entirely pointless if people just walk on by. Therein lies the greater challenge of marketing. Anyone can buy exposure, but how do you turn that exposure into something positive? And when buying exposure via digital marketing – where you can’t literally see who’s walking in and out of your shop – how do you even know whether your campaigns are working? Google Analytics is a free service that gives business owners insight about how people interact with their websites. Learn who visits your site, how they reached your site and what they do on your site. See how long people stay on certain pages and which pages are viewed most. You can also learn more about your visitors, such as which languages they speak and whether they browse with desktop, laptop or mobile devices. All of this information can help focus your marketing toward your intended audiences. Plus, if you advertise in Google Ads, Google Analytics can help you determine whether your ads are on the right track. By analyzing data over periods of days, weeks or months, business owners can identify changes to be made and new audiences to reach out to. In this guide, we’ll walk through a step-by-step process to set up and review Google Analytics reports that will help you measure and improve your digital marketing campaigns. Google Analytics is a free service that’s open to anyone. All you’ll need to create an account is a few minutes and some basic information about your website. You’ll also need a free Google account in order to get started with Google Analytics (if you have a Gmail address, then you already have a Google account). For future reference, you do not need to start another Google Analytics account in order to keep track of data for additional websites. Also, if your business has different divisions with unique analytics needs — such as marketing and sales departments — then each division can have its own profile with separated analytics data within a single account. Enter the requested information, including whether you’d like to track a website or mobile app. Click the “Get Tracking ID” button at the bottom of the page. Copy that code to your clipboard. Your tracking ID code is what Google uses to track activities throughout your website. This code must be added to all of your pages or else you won’t be able to report on every website visit. Advanced Tip: If you already have a lot of tracking codes on your website and it’s getting unruly, then I recommend using the free Google Tag Manager tool. With this tool, you’ll place a code from the Tag Manager on all the pages of your website, and then your analytics tracking ID code goes into the Tag Manager. Later, any changes you make to codes in the Tag Manager – whether that means altering your tracking ID or inserting new tracking codes for different purposes – will be instantly reflected side-wide. No more need to make changes on every single page of your site. Adding the analytics tracking code is easy if your site is built in WordPress or another CMS like Joomla or Drupal; simply add the tracking ID code to your site’s header template file. This template is used on every page of your site. Alternatively, the tracking code can be added manually to each page. One of the most powerful aspects of Google Analytics is conversion tracking using Goals. Goals are specific actions that you want visitors to complete on your website. For example, if you sell products from your website, then one of your goals would be for people to click on “confirm purchase” buttons, indicating that you’ve made sales. Once you set up your Goals, then Google Analytics will automatically track the key actions on your website and attribute those conversions back to the appropriate marketing channel. That way you’ll be able to run reports to see which marketing channels are driving the most leads and sales for your business! Destination: A Destination Goal is accomplished when a specific page in your site loads. A common usage of this type of goal would be keeping track of various “thank you” and confirmation pages that load when people purchase products, register for email updates or request more information. Duration: These goals record how often people stay on your websites for specific lengths of time. A Duration Goal can be applied to specific pages of your site, or this Goal can be applied site-wide. Page/Screens per session: Set these goals to see whether people who arrive at your site are clicking around to view more products or get more information. An example of a Page/Screens Goal would be requiring five page loads per session. Event: An Event Goal is accomplished when visitors complete certain actions on your site. Examples include clicking social media buttons, playing a video, clicking an ad or making a purchase. If you already have Goals set up, then you’ll need to go to Admin in the top navigation and then click Goals under the “View” column. From that page, you’ll be able to click on the red “+ New Goal” button to get to the screen shown below. Advanced Tip: Another tool to familiarize yourself with is Funnels for Destination Goals. When setting a Destination Goal, you can specify how you expect visitors to move through your site. Later, you can run Goal Flow and Funnel reports to see whether visitors interact with your site as intended. This information can help you optimize your site so that visitors accomplish more of your desired goals. Remember, setting up Goals is absolutely critical so you can track the performance of all of your marketing channels. Do not skip this step! Google Search Console (formerly known as Webmaster Tools) is a free tool that helps businesses manage how their sites appear in Google’s search results. By linking Google Search Console to your Google Analytics account, you’ll be able to see how your website is ranked for various Google search queries as well as how many people click to your site from Google. Create an account with Google Search Console at www.google.com/webmasters/. Complete the steps to verify that you own your site. There are several options to verify ownership of your site like uploading a blank HTML file to your server (see screenshot below). After setting up your Search Console account, I recommend you add a sitemap to help Google find your webpages. Go to Sitemaps and add your XML sitelink. Most importantly, you need to link your Search Console and Google Analytics accounts. To do this, log into your Google Analytics account and go to Admin > Property Settings > Search Console (see screenshot below). Simply follow the directions on the screen until your Search Console account is linked up with Google Analytics. Once completed, you’ll gain access to additional reports that we’ll walk through later in this guide. Next, if you’re advertising in Google Ads, then you need to link up your Google Ads account. Google Ads allows businesses to advertise in Google search, as well as on millions of other websites across the internet. If you’re not using Google Ads and don’t plan to in the near future, then you can safely skip this step. For everyone else, I recommend linking your Ads and Analytics accounts to gain more insight into your ad performance. By connecting your Ads and Analytics accounts, you’ll get access to metrics such as how long visitors stay on your site after clicking your ads, and you’ll also see how likely paid visitors are to complete your various analytics goals. Of course, if you’re not already advertising, then you would need to first create a Google Ads account by going to https://ads.google.com/home/. To link Google Ads to Analytics, log into your Google Analytics account and go to Admin > Google Ads Linking (see screenshot below). Simply follow the directions to complete the link between the two accounts. Now, you’ll have access to more in-depth user behavior data for your Google Ads campaigns. OK, just one more step and you’ll have your Google Analytics account set up properly! This step only applies for businesses that operate e-commerce websites. Enabling Google Analytics e-commerce tracking on e-commerce sites allows business owners to track more advanced metrics such as which products are purchased and average revenue per sale. Plus, E-commerce tracking also allows business owners to see where most of their online customers are coming from. For example, you can see how many sales are being generated by your SEO, email marketing, social media, advertising, and/or other marketing campaigns. On the next screen, click the button to Enable Ecommerce as shown below. If you’re using an e-commerce platform that integrates with Google Analytics (ex. BigCommerce), then you can turn on e-commerce tracking within your website’s admin dashboard. Google Analytics is good, but it’s not great when it comes to automatically figuring out where a website visitor came from. For example, if the visitor clicked a link in Facebook, then Analytics will consider that social media traffic in your reports. If a visitor clicked an Google Ads ad in Google.com, then Analytics will consider that Paid Search traffic in your reports. 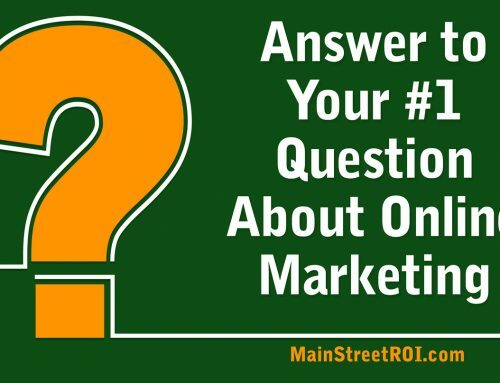 But what about a website visitor from one of your email marketing campaigns? Or how about a visitor from a print ad? In both of those situations Google Analytics can not easily categorize the traffic. The URL Builder is a tool that will add tracking parameters to any URL you enter into the tool. Most importantly, you can add the medium, or marketing channel, to your URL to specifically tell Google Analytics how to categorize the traffic. That means you can use the URL Builder to create a tracking URL for your email campaign and every time a subscriber clicks the link to visit your website, Google Analytics will correctly consider that traffic to be from your Email Marketing. Scroll down, complete the short form, and click the “Generate URL” button. Then simply use the tracking URL in your marketing campaigns. Congratulations! At this point your Google Analytics account is set up properly and it will automatically track all of your marketing campaigns. All of this data is worthless unless you actually look at it! That’s why the remaining steps in this guide explain the most important reports you need to review to stay on top of your campaigns. Getting results from Google Analytics means understanding how to use each of the various analytics reports. The first report you need to be familiar with is the Source/Medium report. This report includes useful data about the source of your traffic (such as Google, Bing or your email newsletter) and the medium of your traffic (search ads, display ads, banner ads, email, etc.). Plus, since you’ve already set up Goals, this report lets you see how different types of traffic are converting into leads and sales. With this information, you can more easily determine where to allocate your marketing budget and resources. To generate the Source/Medium report, go to Acquisition > All Traffic > Source/Medium. Review the Source/Medium report to see which traffic sources are performing well and which need to be improved. The Channels report is a rolled up view of all the information collected for your Source/Medium reports. Rather than view data for channels according to specific referrers or types of traffic, the Channels report shows larger trends according to broader traffic categories such as paid search, email or social media traffic. Business owners can use this report to quickly grasp which marketing channels are providing the best results for their bottom line. Also, results from this report can reveal which marketing efforts are falling short. Most small business owners can get all the information they need from the Default Channel Grouping of the Channels report. The default grouping encompasses the following channels: direct, organic search, referral, email, paid search, social, display and other advertising. To acquire additional channel data, the criteria for each type of traffic can be edited or new channel groupings can be added. To generate the Channels report, go to Acquisition > All Traffic > Channels and then select the proper date rate. If you want to isolate a particular channel to review the traffic trends over a given date range, then click on the channel name. The next page will display data only for the selected channel. As you’ll see, this report is like a “one stop shop” for all of your high level marketing performance data. I recommend you review this report first to get a birds eye view of what’s going on with your marketing, and then dive in deeper as needed. Is your website equipped for how today’s consumers browse the internet? Building a website was much simpler until the tablet and smartphone industries took off. Now, most people view websites on screens the size of the palms of their hands, which means sites must be built with mobile interfaces or responsive designs in order to remain functional for visitors. Business owners who haven’t optimized their sites will likely see lackluster performance from visitors using mobile browsers. Running the Website Traffic by Device report can highlight whether your site needs additional work. To generate this report, go to Audience > Mobile > Overview and select an appropriate date range. Compare performance differences between visitors using desktop, tablet and mobile browsers. Pay close attention to how well each type of traffic converts into accomplishing your site’s goals and keep in mind that mobile traffic tends to convert less than desktop traffic. Note that the Mobile Overview report will highlight traffic and conversion trends per device, but it does not allow you to dig into specific marketing channels. For example, the Mobile Overview report does not tell you how your SEO, email, advertising, or any other marketing channel is performing for each device. To do this you’ll need to apply a Segment to the Channels report (see Step 9 above). To use segments, first run a Channels report and then click the “+ New Segment” button at the top of the screen. Then, select the type of device traffic you’d like to learn more about, and then click “Apply.” Remove the “All Sessions” segment and then you’ll be left with a report showing visitors from various channels for the type of device you selected. You can now click each channel to dig even deeper into how the channel is performing per device. The Search Engine Optimization reports can help you understand how people are reaching your site through Google’s search results. Note that these reports can only be generated once your Google Analytics account is linked with Google Search Console (See Step 4 above). Queries reports show which Google search queries resulted in the most impressions for your website. You can also see how many impressions resulted in clicks, giving you your organic search clickthrough rate. Landing Pages reports show which specific pages of your site were most likely to appear in Google’s search results. This data can help you identify which webpages are ranked well in Google and which ones are more likely to attract visitors. Geographical Summaries reports provide general SEO metrics from different countries, which may not be useful for small businesses with mostly local clients. The metrics in these reports are for Google’s organic search results only. Traffic from advertising, email marketing, social media, or even other search engines like Yahoo or Bing is not included in the SEO reports. To generate your SEO traffic reports, go to Acquisition > Search Engine Optimization > Queries and select an appropriate date range. It’s important to note that these reports can only pull data from the past 90 days. Then click the Landing pages report or the Geographical report links. Advanced Tip: Use the search bar above the table to find specific keywords or landing pages. Then click the “advanced” link to the right of the search bar to help you view more meaningful stats with less clutter. For example, you can limit the report to show landing pages that are getting clicks and are ranked greater than 10 in Google. Those are pages you could likely edit to get on the first page of Google and significantly increase your traffic very quickly. If you’re not advertising in Google Ads, then you can skip this step. For everyone else, I recommend you check your Google Ads Traffic reports in Analytics in addition to using the reports within Google Ads. These reports are loaded with information that shed light on your visitors’ behavior after clicking on your ads. By default your Google Ads report in Google Analytics shows both your ad clicks and your bounce rate (how often people leave your site after viewing just one page), which can help identify which of your ad campaigns are most effective. Further, you can use Google Ads reports to see how users behaved once arriving on your site. Where does your paid traffic click after landing on your website? How long is your paid traffic staying on your site before leaving? To generate a Google Ads Traffic report, go to Acquisition > Google Ads > Campaigns and select the appropriate date range. Google Analytics uses “last click” attribution and Google Ads uses “first click” attribution. That means, if a visitor first clicked on your ad, then went back to Google and clicked on your website in Google’s organic results, then Analytics would attribute the traffic and any subsequent conversions to the Organic (aka SEO) channel. In that same example, Google Ads would attribute the conversion as coming from the Google ad. Both are technically correct, but as you can see this can cause a lot of confusion. Just remember, that the traffic and number of conversions reported in Google Ads will not match perfectly to the traffic and conversions reported in Analytics. Google Analytics provides several reports that can help you track and optimize your social media marketing efforts. You can see how visitors from all social channels interact with your website, or you can focus on trends and statistics from specific channels such as Facebook or Twitter. Social media exposure doesn’t tend to pay off immediately, which is why Google Analytics tracks both immediate and delayed conversions. For example, a visitor who arrives at your website from Facebook and makes a purchase during that same session is labeled as a Last Interaction Social Conversion. If that person leaves your site but returns later to make a purchase, then that visitor is recorded as an Assisted Social Conversion. Both types of conversions must be considered when evaluating social media’s impact on your business. To generate the Network Referrals social media report, go to Acquisition > Social > Network Referrals. This report will quickly show you which social networks are bringing people to your site. You can also see which of your pages are being shared most often on social media sites. To review social media conversions, go to Acquisition > Social > Conversions. This report will display the number of Last interaction and Assisted Social Conversions. Finally, review the Plugins report (Acquisition > Social > Plugins) to see how often visitors click social sharing buttons throughout your site. In other words, which webpages are visitors “liking” or “+1’ing” or tweeting to share on those respective social media sites. OK, at this point you should have your Google Analytics account set up properly and you know how to run the most important reports to track your digital marketing campaigns. We hope you’ve found this step-by-step guide helpful! Want More Google Analytics Tips?